We have been in e-mail contact with Frank Bolte sifu for ages, sharing the same passion for the art of Hung Ga Kuen (Hung Ga Kyun), discussing the theory, history and application. Eventually we have met in 2008 in Hong Kong, and after he moved back from Philippines to Hannover, we started to plan his visit in Prague, or my visit in Hannover. Time has finally come! Being a fan of MMA and a continous learner, I have decided to polish my grappling and general MMA skills with Erik Paulson, who happened to offer an intensive 3 day seminar in Hannover and att he same time visit my friend and teach my Hung Ga Kyun skills in the evenings for Bolte sifu’s school. Easy decision, win win situation! Well, mornings and afternoon of hard training and sparring and teaching in the afternoons was definitely a hard job (sore, bruised and tired), but in the end everything worked out. (Side note: Guys, if you have a chance to learn from Erik Paulson, do not hesitate and just go. Super nice and wise guy, seasoned fighter and excellent teacher). 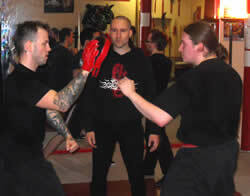 Frank Boltes’s Gwun is and old-school martial arts gym with all modern and traditional equipment one needs. When i have entered the schol, i have immediatelly felt as at home. My friend Frank lives and breaths Chinese martial arts 24/7 – always curious to learn more, find out more, train more. The students of his school learn not only the fighting skills, but also the Chinese martial arts culture, history and philosophy. 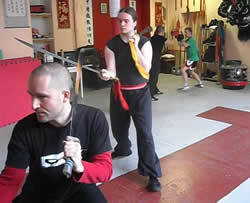 The private lessons i have lead were devoted mainly the core Hung Ga Kyun sets, „Taming of the Tiger in the Gung Pattern“ (Gung Ji Fuk Fu Kyun) and „Tiger and Crane Double Form Set“ (Fu Hok Seung Ying), as well some universal aspects of the training and usage of the power, strengthening exercises, applications and weapons. I call my approach to training and teaching „Practical Hung Kyun“ (Sat Yung Hung Kyun). My students do not spend years and years on learning new and new sets, but working on their strength, conditioning, reality based combat applications and free full contact sparring. Because of this i have decided to teach a special two day seminar devoted to famous „Seven Stars Continuous Striking Combination“ (Chat Sing Lin Waan Kau), a core series of drills of my school and our IHKA association. First seminar day was devoted to basics – history, theory, preparatory exercises, stances, footwork drills, basic techniques (on the spot and with steps) and basic 2-man exercises. Second day’s program was focused on focus mitt drills, using the long bridges entries, attacking combinations and exit strategies. Although most of the students practice just for a a year or so, i have seen hardworking, sincere and open minded to see and try out different way of doing the same thing – true students of their sifu. Late night dinner, good German beer and chat with Frank and his students was a pleasant reward for all of us. 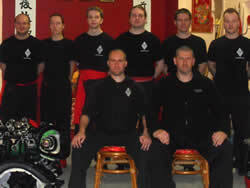 Thanks to Frank Bolte sifu for his invitation and hospitality, i wish all the best to all of you in Hung Kyun Hannover! Train hard, train smart guys! About the author: Pavel Macek sifu (Hung Kyun), a disciple of Grandmaster Lam Chun Sing, is currently teaching in Central Europe (Prague, Czech republic). His system of teaching puts emphasis on a practical application of the art, reality-based self-defense, strength and conditioning as well as research of various Southern Chinese Martial Arts. Please visit his website at HungKyun.com and facebook.com/hungkyuncom.